Nothing fascinates more than a diamond. From their shape and size, to their remarkable ability to capture the light, a diamond is so much more than a precious stone, it is a piece of an exquisite history. As such, we look back at the world’s most famous diamonds ever discovered by humankind. The Cullinan is the largest gem quality diamond ever found. It was named in honour of Sir Thomas Cullinan, the founder of the Premier Mine. The diamond was divided into 9 major gemstones, 96 smaller stones and about 19.5cts of unpolished pieces. The two largest gems were kept for England’s regalia and the rest went to Asscher as payment. King Edward bought one of the major gems for his consort, Queen Alexandra. The Transvaal government bought the remaining stones and pieces, and presented the other 6 major gems to Queen Mary in 1910. Two of the small stones were presented to Louis Botha, who gave one to his daughter when she turned 17. When the Cullinan was first discovered, signs suggested that it could have been part of a much larger crystal, but no discovery of the ‘missing half’ has ever been authenticated. The Star of Africa Diamond is the largest cut diamond in the world. It is a pear shape with 74 facets and is found in the Crown Jewels of the United Kingdom, mounted in the head of the Sceptre with the Cross. It was cut from the 3106 carat Cullinan, the largest diamond ever found. Also known as “Le Bijou du Roi” (the King’s Jewel”), the Hope Diamond is considered one of the most famous diamonds in the world. It is notorious for supposedly being cursed and has a long recorded history. It received its name from Henry Thomas Hope. This diamond was believed to have a great mystical power that surrounded its unusual size and unique colour, a deep indigo blue. It is said that the Hope Diamond was used to adorn the statue of a Hindu idol. It is currently housed in the Smithsonian Institute in Washington D.C. The Excelsior is said to be the second largest stone ever found. Until 1905 when the larger Cullinan was found, the Excelsior was the largest known diamond in the world. It had a blue-white tine and had an unusual shape - flat on one side and rose to a peak on the other - resembling a loaf of rye bread. It’s believed this is what inspired the diamond to be named “excelsior”, meaning higher. The diamond was cut into 21 polished stones, of which is a marquise of 69.80ct. The Star of Sierra Leone is the third largest rough diamond and the largest alluvial gem diamond ever found. The diamond was originally cut into a 143.20ct Emerald cut, but upon inspection it revealed inclusions. It was then recut into seven smaller stones, the largest of which weighs 35.52ct. A rare characteristic of the stone is its perfect chemical purity. It is ranked as a type IIa diamond, a category that includes less than 1% of all diamonds. The largest faceted diamond in the world, the Golden Jubilee was first known as the “Unnamed Brown” and was considered something of an ugly duckling by most. It was given to designer Gabi Tolkowsky to design, cut and polish, which took two years. It was purchased by a syndicate of Thai businessmen and presented to the King of Thailand in 1997 for his Golden Jubilee - the 50th anniversary of his coronation. It is now located in the Royal Thai Palace as part of the crown jewels. The Centenary diamond is the world’s second largest modern-cut flawless diamond and the largest fancy cut diamond in the world. It is remarkable for its many facets (164 on the stone and 83 on the girdle) and is the only diamond to combine the oldest methods with the most modern technology in cutting. The rough diamond resembled an irregular matchbox with angular planes, a prominent elongated “horn” jutting out at one corner and a deep concave on the largest flat surface. Discovered by means of an electric X-ray recovery system, only a handful of people knew about the diamond and all were sworn to silence. De Beers later unveiled The Centenary Diamond on the company’s 100th birthday in 1988. The Eureka Diamond was the first diamond discovered in South Africa and led to the Kimberley Diamond Rush. It was found by chance on the banks of the Orange River, near Kimberley, in 1867 by 15-year-old Erasmus Jacobs. He handed it to his neighbour, Schalk van Niekerk, who was a collector of unusual stones. Van Niekerk handed over the stone to a travelling pedlar, John O’Reilly, who sent it to Dr W.G. Atherstone of Grahamstown, who was one of few people who knew about gems and minerals. Dr. Atherstone identified the stone as a 21.25ct brownish-yellow diamond and was sold to Sir Phillip Wodehouse for GBP1,500. It was cut to a 10.73ct cushion-shaped brilliant. The Incomparable Diamond is the third largest diamond ever cut, surpassed by the Cullinan 1 and the Golden Jubilee. A young girl encountered the diamond in a pile of rubble collected from old mine dumps. It was considered to be cut into the world’s largest gem, but the size was reduced for the sake of having fewer internal flaws. The rough stone was cut into one large diamond (the Incomparable) and 14 smaller diamonds, which range from colourless to deep rich brown. This diamond is remarkable for its internally flawless clarity, its unusual triolette shape and its natural fancy brownish-yellow colour. Initially known as the Reitz Diamond, The Jubilee Diamond was discovered by workers in 1895 in the Jagersfontein Mine. It weighed 650.80ct rough, and at the time of its discovery, it was the second largest diamond known to man. Today, it is the world’s sixth largest diamond. It was cut into two large diamonds, both admired for their remarkable clarity, colour and brilliance. In honour of the sixteenth anniversary of Queen Victoria’s coronation, the larger of the two diamonds was named the Jubilee. The Jubilee, as well as The Exelsior, was acquired by a conglomerate of diamond merchants in London, which comprised the firms Wernher, Beit & Co., Barnato Bros. and Mosenthal Sons & Co. Shortly after De Beers Consolidated Mines Limited formed in March 1888, a light yellow octahedral crystal was discovered in the De Beers Mine. Impressively large, it weighed 428.5 old carats – “old carats” was the non-metric carat before 1913 – and it measured 47.6mm through its longest axis and 38.1mm square. The De Beers Diamond, at the time of its discovery, was the largest diamond discovered at the four mines at Kimberley (excluding Victoria, whose source is doubted and unconfirmed). Excluding the Nizam (a partially-cut stone which is now lost), the De Beers is the world’s seventh largest faceted diamond, weighing 234.65 carats. Though it is uncertain where the diamond was cut, it is likely that the work was done in Amsterdam, which was emerging as a diamond cutting centre at the time. Discovered by Mr. Jonker on 16 January 1934, The Jonker Diamond was bought by Sir Ernest Oppenheimer for US $700 000. Twelve brilliant stones were obtained from the rough diamond, the largest of which weighed 142.9ct and was named The Jonker. The Premier Mine in South Africa was known for producing the Cullinan Diamond (1306 carat), and in March of 1978, it produced yet another extraordinary diamond. Weighing 353.9 carats, this diamond, with its triangular-shaped cleavage of the finest colour travelled through a number of stages of mining recovery before emerging at the grease table in the recovery plant. The Premier Rose weighs 137.02 carats, and is known as one of the largest D-colour flawless diamonds in the world. One of the world’s largest fancy yellow diamonds, the Tiffany Yellow Diamond weighed 287.42 carats when it was discovered in the rough in 1878 at the Kimberley Mine, South Africa. To maximise and accentuate its brilliance, it was cut into a cushion shape diamond, weighing 128.54 carats, with 90 facets (32 more facets than that of the traditional round brilliant cut diamond). The Tiffany Yellow Diamond appeared in the ‘Bird on a Rock’ – a 1960s setting by Jean Schlumberger, loaned by Tiffany & Co., New York. The Niarchos Diamond was internally flawless and weighed 426.5 carats. It was slightly chipped, most likely as a result of contact with the mine’s underground crusher. Sir Ernest Oppenheimer thought it had the most perfect colour he had ever seen in a diamond, and his opinion was shared by many fortunate enough to see it. Unnamed, the diamond was shipped to London, and in February 1956 the Diamond Trading Company announced that a sale of rough diamonds of GBP 3 000 000 was made to Harry Winston Inc. of New York. At the time, this was the largest single sale ever made to one of its clients. The diamond was cut into a pear shape with 58 facets, plus 86 facets around its girdle and weighing 128.25 carats. Nicknamed the ‘Ice Queen’ by de Haan, the Niarchos Diamond was unveiled to the world on 27 February 1957. In April 1958, National Geographic Magazine featured an article on diamonds which detailed the cutting process of the Niarchos. Shortly thereafter, the late Greek shipping magnate Stavros Niarchos purchased the gem for Charlotte Ford, his wife at the time. He reportedly paid US $2 000 000. Members of the Ford family referred to it as ‘the Skating Rink,’ but Niarchos was undisturbed by their comments, having also purchased two other gems that yielded from the 426 carat rough diamond. After their divorce, Niarchos’s name was bestowed upon the diamond, and he generously lent it to be displayed in various exhibitions. The Niarchos was returned to South Africa in 1966 for the famous ‘Jewel Box 1966’ exhibition. After his death in 1996, no further information about the Niarchos Diamond has been released. Discovered in roundabout the 13th century, this gem received its name, Koh-I-Noor in 1739 after a Persian conqueror named Nadir Shah took Delhi and obtained the diamond. He gave it the name Koh-I-Noor, meaning ‘Mountain of Light.’ The diamond weighed 186 carats and was given to Queen Victoria in 1850. Two years later it was cut into a Round Brilliant weighing 108.93 carats. Currently on display in the Tower of London, the diamond has been used in the crowns of numerous kings and queens. This rough piece weighed 78 carats, and was expected to yield a stone of roughly 24 carats. The large piece, which weighed 162 carats, was to produce a pear-shaped diamond, and was expected to weigh 75 carats. Found in the Kimberley Mine in South Africa, this 70-carat diamond is flawless and champagne-coloured. In 1921 it was recut into its modern shape from a large, flat stone (which was once housed in the Russian Crown Jewels). Recut by its owners, Baumgold Bros., New York City, in 1958 to improve its brilliance and proportions, it now weighs 55.09 carats, and was valued at US $500 000. In 1971 Baumgold Bros. sold the stone to an undisclosed collector. Renowned for the intensity of its colour, this heart-shaped stone, weighing 27.64 carat, is described as ‘vivid blue.’ In January 2000, it was unveiled along with 11 rare blue diamonds as part of a special collection of De Beers Millennium Jewels. 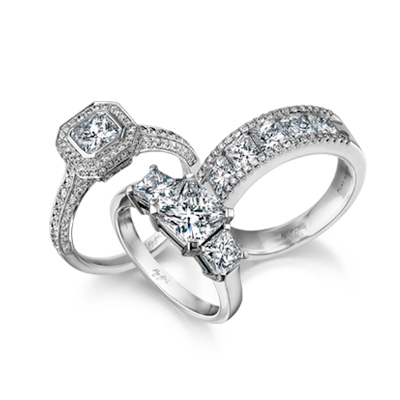 This collection also featured the Millennium Star, and was gathered over many years by the De Beers Group, to celebrate the arrival of a new millennium.